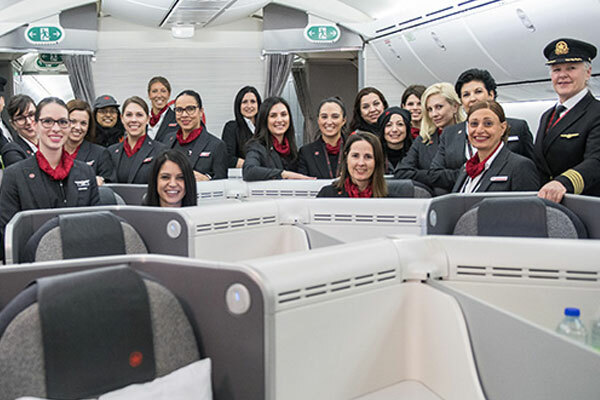 Air Canada marked International Women’s Day 2019 by operating flight AC832 from Montreal to Brussels with all female pilots and flight attendants today. The Boeing 787 Dreamliner flight, which arrived in Brussels this morning, was additionally supported by female ground crews providing customer boarding, aircraft servicing, loading, pushback and flight watching functions. And to check the flight’s departure preparations along with comments from the women holding Air Canada’s most senior international leadership positions, just click here. Air Canada has 30,000 employees worldwide of which approximately 14,000 are women, with thirty percent of Air Canada’s senior management comprising women. For more on Air Canada’s women of the world, just click here.